Commercial vehicles equipped with spring brakes make up approximately 98% of all semi-trucks. Manually measuring the stroke length on these brakes can be a time consuming job. There is also the chance of different interpretations when reading a manual scale in confined areas. It is now possible to test five (5) pairs of brake stroke lengths at once, in a minimal amount of time. The Brake Analyst is a testing device designed to determine slack adjuster travel on vehicles equipped with S-cam air brakes. It can also determine if there is excessive wear in the S-cam bushings, and broken components such as brake shoe return springs, parking brake chamber springs, and brake chamber return springs without further assembly. On a normal class 8 tractor trailer, as seen on today’s highways, the tractor trailer is equipped with ten separate brakes, one located at each wheel. The normal adjustment of the slack adjuster is in the 1 to 1.5 inch range. The re-adjustment point is at 2 inches for most brakes. The Brake Analyst measures the slack adjuster travel. It accomplishes this by a purpose built string potentiometer that is attached to the brake chamber pushrod by a small pair of locking pliers. The cable from the string potentiometer is magnetically attached to the face of the brake chamber. A secondary pressure transducer records air pressure being supplied to the service brake system. Electrical cables are routed from the equipment to the control panel. 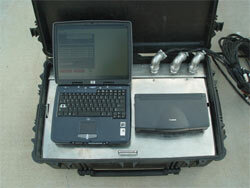 The cables connect to a laptop computer through a PCM-CIA card. The information is then fed from the remote sensors into the data acquisition software that analyzes the information and presents it in a graphical and tabular form on the computer screen. The Brake Analyst system can drastically reduce brake inspection time and is commercially available through AVD, Inc. For more information, contact Analysis, Inc.